I’ve been a fan of Jaimie Admans’s books since her debut, Kismetology. 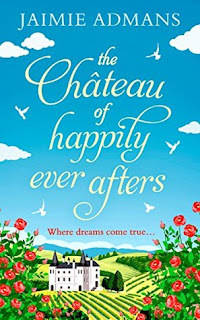 The Chateau of Happily Ever Afters was a breath of fresh air. With Admans’ trademark humour, wisdom, and sass, plus a touch of magic, this book was a delight from beginning to end. I connected quickly and easily with Wendy. Besides being the same age, we’re similar in other ways - she’s afraid to go outside her comfort zone or take chances, and she has trouble trusting people, and I related to those things. I think if I’d been placed in the same situation as hers (co-inheriting a French chateau with a hot Scot), I would have acted/reacted much differently than she did, but her pettiness and immaturity were fun to read and had me laughing myself silly. I was glad when she started to come around and formed a tentative friendship with Julian, because these two were perfect for each other. They were both complex characters with realistic issues and hang-ups about relationships, and I loved watching them turn from enemies to a tentative truce to friends to something more. I adored Julian, and I appreciated how he turned Wendy’s perceptions of him upside down - he had so much depth to him and was much more than just a pretty face and a hot body. 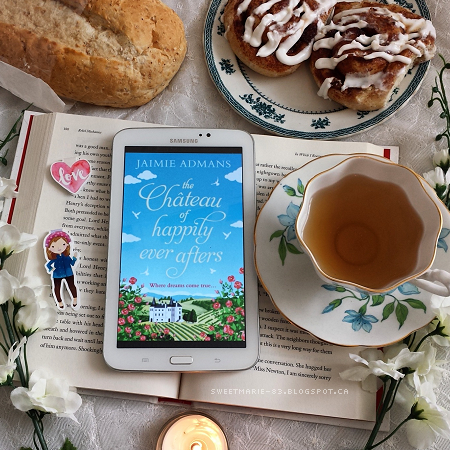 Hilarious, charming, and romantic, The Chateau of Happily Ever Afters is one of my new favourite romantic comedies. I was transported to Normandy and could easily picture myself living in the Chateau and experiencing life in the village. Read this book if you want to feel like you’ve been whisked away to the French countryside where you’ll laugh, swoon, fall in love, and be reminded what it’s like to believe in magic. Have you read The Chateau of Happily Ever Afters? What did you think? If you haven't read it, do you plan to? Do you like romantic comedies? Have a favourite? Awww! Thank you SO SO SO much, Marie! I'm so glad you liked it, and reading this review has absolutely made my day and settled some pre-publication nerves! My biggest goals were to make the setting realistic and hoping that readers would like Julian as much as I did, so I'm so happy those things came across! Thank you again, you've put a massive smile on my face!